Hi friends and welcome back to my summer road trip through the world of healthcare. For those who are new to my adventure, this is the third part of the blog series. Catch up right here with Part 1 and Part 2. 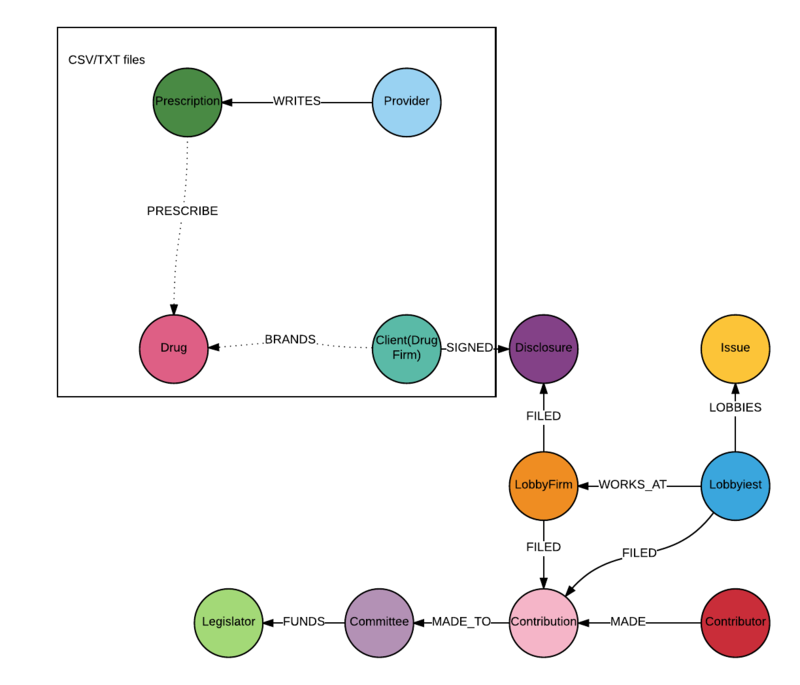 I am using Neo4j to connect the multiple stakeholders of healthcare and hope to gain some interesting insights into the healthcare industry by the end of my exploration. This blog series demonstrates the entire process from data modeling and ETL to exploratory analysis and more. In the previous two posts, I discussed data modeling and how to integrate XML data to Neo4j by using APOC, you can find every single detail about the project on Github. This week, I will be working with CSV files. If you are using Neo4j for the first time (like me), I can tell you honestly that loading CSV files to Neo4j is a lot easier than loading XML files. But don’t get too optimistic about it unless your data is perfectly clean. Now, let me show you the steps I used to successfully load the CSV files. As the healthcare provider data gave me the most problems, I will use this data as a demonstration in this blog post. A. What does the data look like? B. How many rows are in the data? Each row of the data represents a registered provider in the United States from 2005 to 2016. C. How many columns are in the data? Now you see my point why I said the data is a little bit crazy. But don’t panic – most of these columns do not contain values and we only need to extract a few columns to load them to my healthcare graph. D. Remove the header from the data. This will delete the first line and save the content to a new file named provider.csv. The original file will not be changed. It’s optional to remove the header in your file because Cypher supports the ability to load a CSV file with a header and refer to the column using the header. 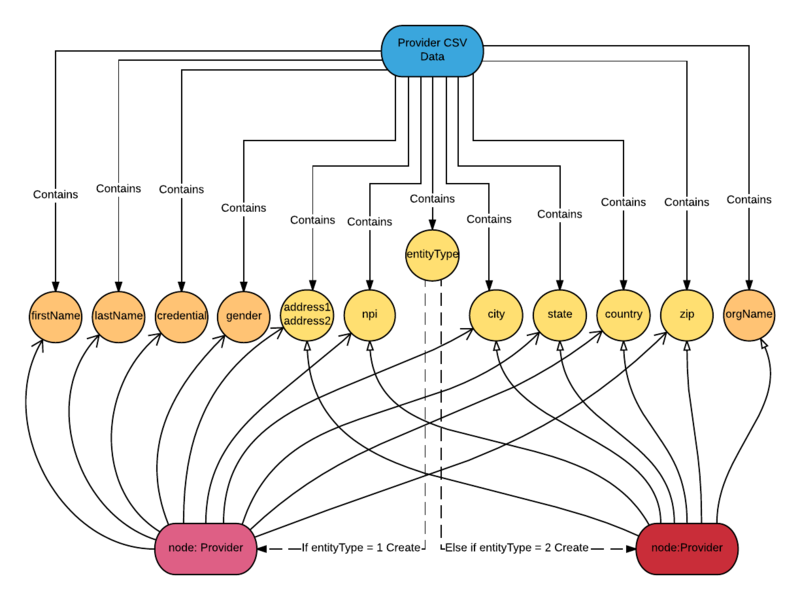 Here is a great walkthrough tutorial of loading CSV files to Neo4j. In the figure above, I only displayed the columns that I will load into the healthcare graph. I want to create :Provider nodes with these properties: npi, entityType, address, city, state, zip and country. When entityType is 1, I add properties: lastName, firstName, credential and gender to the node. When entityType is 2, I add the property: OrgName to the node. The FOREACH statement is used to mutate each element in a collection. Here I use CASE WHEN to group the data into two collections of rows: the rows with col = 1 and the rows with col = 2. For each row in the col=1 group, I use the FOREACH statement to set the firstName, lastName, credential and gender properties, and for each row in the col=2 group, I set the property orgName. and whereas it ends that quote there seems to be characters in that field after that ending quote. "908 N SANDHILLS BLVD","","ABERDEEN","NC","283152547","US","9109442383","9109449334","908 N SANDHILLS BLVD","
The problem is there is a \ character inside the field PRESIDENT\, and when loading the file, Cypher will skip the double quotation followed by the \, thus it gets confused on how to map the fields. The command searches for the \ character in the file and counts the lines which contain the pattern that we are looking for. The result is 70. There are many ways to fix this problem. Below, I replace the \ with / and load it into a new file. Now let’s try to reload the CSV file again. This time I am loading the file from Python client. By using periodic commit, you can set up a number of transactions to be committed. It helps to prevent from using large amount of memory when loading large CSV files. Now, I have successfully loaded the healthcare provider data into Neo4j. The process of loading drug, drug manufacturer and prescription data are very similar. I also created the relationship WRITES for the nodes :Provider and :Prescription based on the NPI information contained in both files. By now, all the data is stored in the graph database. I hope you find this blog post helpful. Sometimes cleaning large CSV files can be tricky, but using the command line to manipulate the files can make the work go faster. In the next blog post, I will show you how to link data when you have limited resources. Specifically, I will demonstrate how I created the relationship (:Prescription)-[:PRESCRIBE]->(:Drug) and (:Drug Firm)-[BRANDS]->(:Drug). Stay tuned, and I’ll see you soon! Ready to dig in and get started with graph technology? Click below to download this free ebook, Learning Neo4j and catch up to speed with the world’s leading graph database. only first two columns in it but not the other columns including city, adress so please tell me how to proceed further . Other columns like address, city not present in NPI data link provided by you.